Picturesque Polonia, at the northeastern tip of the island, is the point of departure for this route, a route rich in images, history, impressions, and experiences. We start out from the village with its sandy beach, beautiful houses, and little harbor which has for ages connected the island with Kimolos. Obviously named after Apollo, god of the sun and light, white-washed Polonia makes it clear why the name was chosen. According to one historical source (Pierre-Augustin Guys, “Voyage Litteraire de la Grèce”, 1783), there must have been a temple of Apollo in the area until at least the mid-18th century. Its existence has been confirmed by archaeological finds such as the drums of ancient columns, capitals, and a sarcophagus unearthed near Cape Pelekouda, to the north of the little bay, all of which are now in the Milos Archaeological Museum in Plaka. Its capacity for mooring, protection from northerly winds, gentle topography and proximity to Kimolos have all played an important role in the development of the settlement since ancient times. Although in modern times there had been a small, isolated village of farmers and fishermen there, Polonia began to develop further after 1934, when Silver & Baryte Ores Mining Co. S.A. (now S&B Industrial Minerals S.A.) created the first mineral processing plants in neighboring Voudia. Many homes and roads were built at that time, and in 1936 the first elementary school in the area opened, with the company’s financial support and efforts. Many of the people of Polonia worked in the plants and the mines, but they did not abandon their traditional occupations of farming and fishing, and in recent years many have been working in tourism, especially in the summer months. 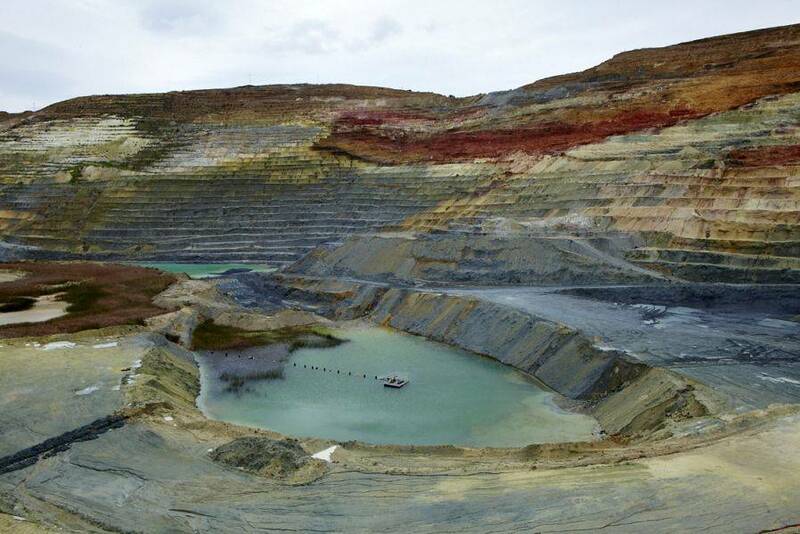 It is worth noting that even today residents of Kimolos who work in the Milos mines and the plants at Voudia, take the boat to Milos daily and return on the same day after they have finished their shifts. From the beach, where the buses stop, follow the asphalt road that heads south/southeast toward Voudia. Bid farewell to the last houses of the village, then go by the football field, and a little further you will see the chapel of the Exaltation of the Holy Cross (P1) by the side of the road on your left. Right after the chapel, you enter the premises of S&B and the mining zones. The asphalt road ends here, and from now on you’ll be on a road with a lot of traffic from trucks and heavy machinery. In case of rain, humidity, or sprinkling in summer (to settle dust), the road, though wide, becomes very slippery and requires great care. This slipperiness is due to the nature of bentonite, which like modelling clay is particularly slippery when it has absorbed water. It also sticks to and builds up on tires and footwear. Southwards, on the hill in front of and to the right of you, the reclaimed deposits of the Zoulia mine, where bentonite is mined, are visible. On your left, you can see the facilities of S&B. The company initially operated on the island by mining baryte, a barium mineral with a high specific gravity, in Pilonisi. Milos baryte had a relatively high silver content, but silver production through beneficiation never proved to be economically viable. The baryte was used in oil drilling, mainly in the Middle East. S&B is often called “Barytine” on Milos, although, practically speaking, its production of baryte came to an end decades ago. Thereafter, in chronological order, the company added kaolin, bentonite, and perlite to its line-up of mining products, which are industrial minerals used in a number of industries and industrial products (in ceramics, foundry, iron ore pelletizing, building materials, etc.). The company began its operations in Voudia, always export-oriented, and today it is an international minerals and materials group with plants and mines in 20 countries and sales in more than 70. Continuing on, to the left is the big closed (for environmental reasons) bentonite warehouse, while behind it in the background is the bentonite drying unit. In the surrounding area you can see the bentonite natural drying fields. The bentonite is spread out here in order to reduce its water content, an environmentally friendly natural practice that saves energy, but also one that decreases CO2 emissions by 24,000 MT per annum, and for that reason received an award from the Industrial Minerals Association-Europe in the European Parliament in 2012. Continuing further, you pass close to the bentonite activation unit and then the raw perlite stocks that supply the processing plants. The cylindrical silos are for the storage of finished perlite products, and you can see the covered conveyors which transport the minerals to the plants or to intermediate storage facilities and finally to the loading bridge, the largest on the island, which can be seen at the end of the bay to the northeast, accommodating ships with a capacity of up to 30,000 MT. On the hill, to the north, you can make out the old stone buildings which served as living quarters for the workers, some of whom lived on the premises with their families. The combination of industrial Voudia with touristic Polonia is unique, since the activities of both happily coexist and flourish with a distance of a few hundred meters of each other. Passing by the gate of the industrial facilities, adjacent to the offices, you head southwest, going uphill to your right. Behind you there are views to Kimolos and uninhabited Polyaegos, and, weather permitting, Folegandros, Sikinos, and Ios. About 1 km past the industrial facilities gate, you see on your left the reclaimed Tsantili bentonite mine (P2), no longer in operation, the pits of which have been filled in and reshaped and sides planted. The surrounding slopes are covered with vegetation such as mastic (Pistacia lentiscus), thorny burnet (Sarcopoterium spinosum), spiny broom (Calycotome villosa), and genista (Genista acanthoclada), which coexist with perennial grasses such as smilo grass (Oryzopsis miliacea) and thatching grass (Hyparrhenia hirta). Among them the bulb plants asphodel (Asphodelus microcarpus) and sea onion (Urginea maritima) survive grazing. 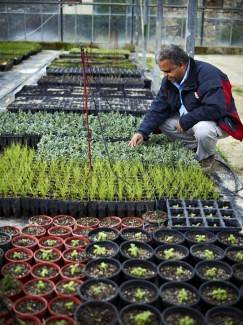 Most of these species grow and propagate locally, and are used in the reclamation of mines. 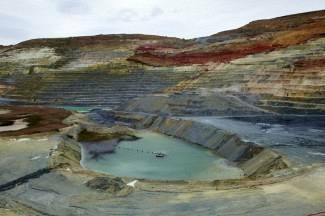 Across from the reclaimed Tsantili mine are the active “Aspro Chorio” (White Village) bentonite mines in the area of Korakia. The north and south “Aspro Chorio” mines first operated in the early 1980s. The south pit is almost exhausted, and a large part of it is used for the natural drying of bentonite, much of it having been filled in with the overburden from other bentonite mines. The north pit has been mined continuously since the 1980s in a deposit that extends to the north and northeast. The rocks in this area overlaying the bentonite deposits are quite hard (dark brown lavas). Continuing on, you come to two successive “forks” (intersections), at both of which you take the road to your right, heading west, and you get on the main dirt road of the mine, which takes you to the large and impressive Aggeria mine, which you can see from the specially formed observation point (P3). The mine has been in continuous operation since 1986. 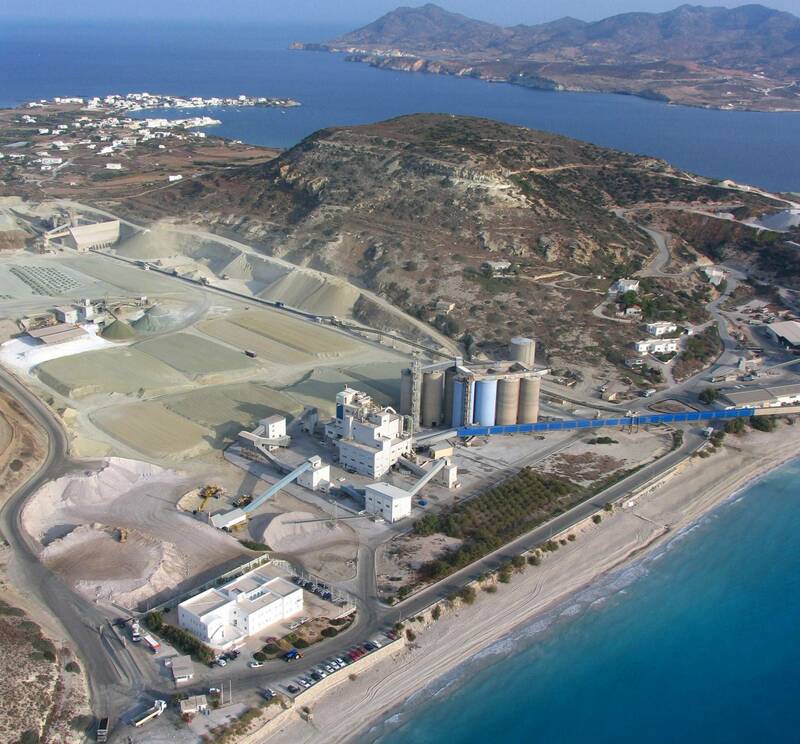 It is the main mine for a large deposit of bentonite, which extends from Koufi (eastwards) to Aghia Irini (westwards) over a distance of about 2.5 km. The deposit is 700 m wide (in a N-S direction). In the southern part, the geological formations from the surface of the ground downwards are colorful and impressive. They include volcanic lahars (mudflows), volcanic rocks and red, brown and white sedimentary limestone intercalations filled with fossils (gastropods, bivalves) visible to the naked eye from close up, and yellow, green and blue bentonites. The mines Koufi (in the east) and Aggeria (in the center) have been joined together, while with the Aghia Irini mine (in the west) there are distinct boundaries (the road that connects its northern and southern sides). At the bottom of the Aggeria mine a lake has been formed mostly by rain water and is used for sprinkling the dirt roads of the mine and plant to keep the dust down. The Aggeria mine is one of the largest bentonite mines in the world. It is quite possible that some parts of your car (the engine, the brake discs) have been cast in green sand molds in which bentonite from the mine in front of you was used as a binder. The stages of the production process of bentonite are as follows: first the bentonite deposit is uncovered at the mine by excavating and removing the overburden material, poor in expandable clays. Next, the mineral is mined with bulldozers, loaded onto trucks with loaders, and carried to the Voudia facilities for further processing (crushing, activation, field drying, industrial drying). Bentonite cannot be mined during the winter months because of the slipperiness of the clay material. In no mine are explosives used for removal of the overburden and the bentonite, since bulldozers extract the mineral smoothly and effectively. From the observation point (P3), go back 200 m and turn left on the dirt road that goes north, following the signposts for Route 4. Just 80 meters past the intersection on your right you will see the chapel of Aghia Ekaterini (built after the 1980s). The dirt road runs along the northern deposition of waste material from the mine (P4), where the reclamation begun in 2002 has yielded successful results, since the artificial hill has incorporated the color and morphology of the surrounding natural hills. The plants that were planted as part of the reclamation are shrub medick (Medicago arborea), Spanish broom (Spartium junceum), Mediterranean saltbush (Atriplex halimus), Jerusalem sage (Phlomis fruticosa), wormwood (Artemisia absinthium), tamarisk (Tamarix sp.) and, less commonly, Phoenician juniper (Juniperus phoenicea) and cypress (Cupressus sempervirens). Land reclamation begins when all usable quantities of minerals have been extracted from the mine, at which point the mine is depleted (or “exhausted”). Reclamation refers to the excavations themselves as well as the external deposits of waste materials removed from the mine during mining which have accumulated in adjacent areas. The reclamation of a depleted mine aims to restore the landscape, especially its vegetation, as much as possible to its prior state, so as not to alter the morphology of the landscape and, as far as it can be done, for it not to be perceptible to the observer. This effort on Milos, with a local climate that is “semidesert” in terms of aridity and high temperatures, combined with its proximity to the sea and the winds that blow in the area, presents a challenge. Grazing by sheep and goats must also be factored into reclamation efforts. The solution is both simple and difficult: it is using native plants that over the centuries have developed mechanisms to deal with all the difficulties mentioned above. All are plants eminently resistant to grazing. In summer, these plants are not green but neither do they dry up. They merely drop into a summer sleep (aestival dormancy) to overcome the prevailing adverse summer conditions of drought and high temperatures. Heading now to Pachaina, on your left you see another reclaimed area (P5), from the Aghia Irini mining unit. To the left and right of the road (P6), you encounter clumps of cedars (Juniperus macrocarpa), and then individual cedar trees scattered all the way to Fylakopi (or Flakopi). As soon as you come out on the main asphalt road at Pachaina, turn right. Right away you’ll see two of the major attractions of this route, the beach at Papafrangas and, right next to it, the archaeological site of the settlement at Fylakopi, which is worth a closer look. Papafrangas (P7) is a small sandy beach accessed by stairs starting west of the archaeological site of Fylakopi. One of its features is the narrow cleft in the shore that ends up in the sea and the sea cave. In the impressive white rocks of Papafrangas “bombs” of pumice are scoured out and bound together in a compact layer with a white powder of the same composition, the result of layers of ash rich in pumice having been deposited in a marine environment. These layers have undergone a slight compression and cracks have appeared on the surface, which have then been widened by the action of waves and have created formations such as the Papafrangas cave. Fylakopi (P8), a guarded archaeological site, is one of the most important prehistoric settlements of the Cycladic civilization; a sub-period bears its name. The most important settlement on Milos in the Bronze Age, it is situated at a strategic point on the north coast of the island, keeping watch on the sea. A large part of the settlement had already been thrown into the sea even in ancient times. Archaeological research in the late 19th and early 20th century (1896-1899, 1910) found traces of habitation from the beginning of the Early Bronze Age (ca. 3000 BC). Those first residents lived in a small farming village, but not an organized city. Thereafter, there are clear successive phases of habitation. 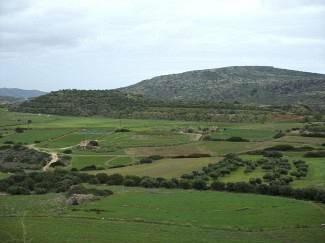 Around 2200 BC the first city of Fylakopi (Fylakopi I) was built, with small, scattered houses. Tombs were located inside the city and the harbor was small, reflecting the size of the ships of the era, with relatively easy access to Kimolos and from there to Sifnos and then to other islands or further afield, to the mainland, avoiding long, dangerous voyages. In 2000 BC the second city (Fylakopi II) was built, which was fortified with walls. Unfinished or partially worked dark stones from the andesite dome adjoining its eastern boundary were used as building materials, as evidenced by significant excavations there. Burials then took place outside the walls. The second city was destroyed in an earthquake or raid around 1600-1550 BC, which left extensive traces of destruction. The city and the wall –of the “cyclopean” type– were rebuilt in the mid-second millennium. This is the third phase of occupation (Fylakopi III), which was most likely destroyed by an earthquake around 1400 BC. Fylakopi III was clearly influenced by Minoan civilization in all aspects (architecture, pottery, fresco painting, etc. ), paving the way for a new rebuilding (Fylakopi IV) with Mycenaean cultural influences and construction of sanctuaries and a central building for the ruler on the model of Mycenaean palaces. The city was abandoned around 1100 BC. It has been established that in this last phase of occupation workshops for working obsidian were in operation in connection with the Mycenaean sanctuary of the settlement. 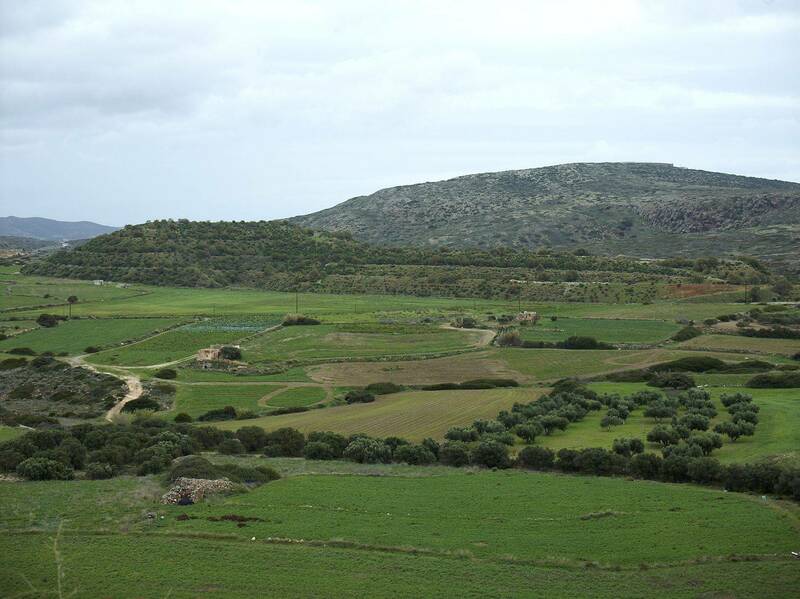 Fylakopi’s peak period during the Bronze Age, especially in its last two phases, was initially attributed to the important role of the settlement in trading obsidian (which was quarried at Nychia and Demenagaki). In any case, the involvement of the inhabitants in the trade and distribution of obsidian, in addition to traditional occupations (fishing, agriculture), is documented by their network of contacts with the rest of the Cyclades (Thira, Kea, and Naxos), Crete, the islands of the northeastern Aegean, but also mainland Greece and the eastern Mediterranean. Typical of the finds at Fylakopi, besides vases, are stone, clay and bronze figurines (above all the famous “Lady of Fylakopi” clay figurine which was found in the sanctuary, a work of the Mycenaean period which is now on view at the Milos Archaeological Museum), as well as a tablet in Linear A, and various bronze objects and stone vessels. Continuing along the route to the northeast on the asphalt road, you head back towards Polonia. Once you leave the shore, going uphill, you see a rock-cut excavation on private land. This is the typical way of creating storage areas, stables and houses on Milos and is a sample of the expertise and ease with which people take advantage of the volcanic nature of the island. Continuing uphill towards Polonia, on the left slope of the road (P9), you will see andesitic lavas in the form of extruded domes (or outflows with breccia). These belong to the lower Pliocene and have distinctive, striking columnar segmentation (columnar joints). These lavas dominate the whole of the Kalogeros cape. They take most impressive form, however, at Glaronisia, the three rocky islets west of the cape. These islets are geological formations of volcanic origin, born from rapidly cooling lava forming these hexagonal “rods” of basalt. The andesitic columnar segmentation in this part of the beach, from the ancient city of Fylakopi to the chapel of Aghios Ioannis have been transformed by the action of waves into roundish black boulders that have been used extensively as a building material (as in the dry-stone walls on the sides of the road). This whole area is covered with phrygana dominated by Jerusalem sage (Phlomis fruticosa), while besides the typical phrygana species, there are scattered Phoenican junipers (Juniperus phoenicea), remnants of an old forest that today forms beautiful clumps only in a few spots near the beds of streams. About 200 m further on you will find the chapel of Aghios Fanourios, while continuing on, on the left you will see the entrance to the S&B plant nursery (P10), which you can visit during working days and hours. Here dozens of species of native herbaceous and woody plants of the island are collected and cultivated. Each year 700 to 1,000 kilos of local seeds are collected. Most of them are used in hydroseeding (this is a method of sowing, especially of herbaceous plants, which is employed in soils on steep slopes, where agricultural machinery cannot be used). 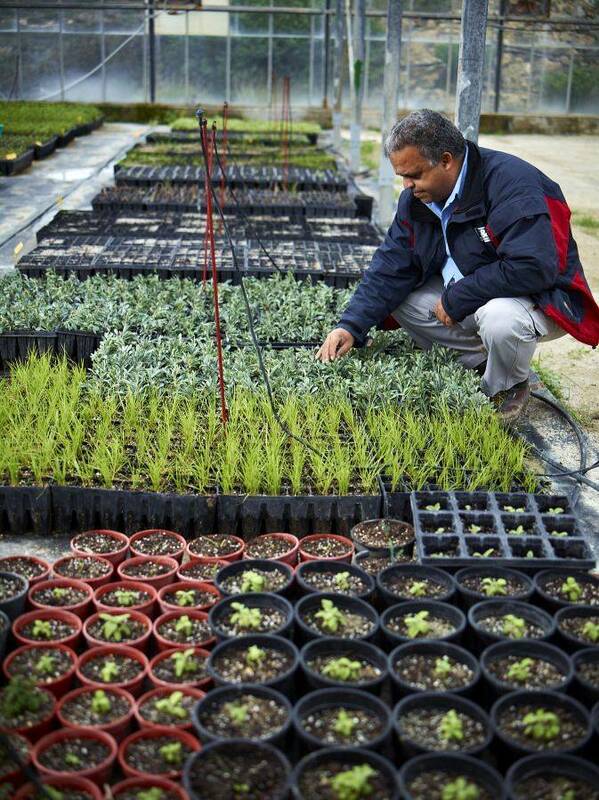 Here, too, dozens of native woody plants are propagated every year, which, once they reach an appropriate stage of growth, are planted on land in the process of reclamation by the company. The main road that descends to the northeast leads you once again to Polonia. To best complete this route, follow the shore road to Cape Pelekouda (P11), where near the shore you will see a few “syrmata”, undercut areas where boats are hauled out for protection from waves and which are a particular architectural feature of Milos, the fruit of the inhabitants’ expertise in excavating. Pelekouda has special geological interest. Here, layers of pumice tuffs have undergone erosion from running water on land or underwater sea currents. These grooves, terraces and other signs of erosion by water have been preserved in the surfaces of rocks along the northern coastline, near the lighthouse. Later, reprocessed tephra material, rock fragments or fossilized shells were deposited on these surfaces. Over these “sits” a mudflow (“lahar”), a formation composed of fragments of volcanic rocks of various sizes which have been ejected from the crater. This formation has penetrated into the underlying tephra, and in some places where it has been eroded in the sequence outlined above you can see large pieces of dacite and andesite like ornamental remains of the underlying tuff. The name of Pelekouda deserves a brief mention: it’s what the natives call a migratory shorebird of the peewit genus, which makes a stopover in this area during its migratory journey. From this point you have a panoramic view of Kimolos. 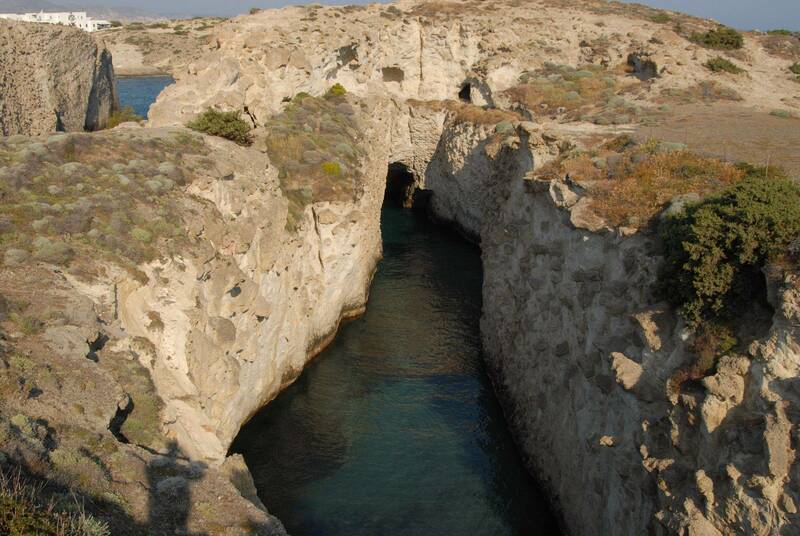 A narrow, 900-meter-wide channel separates it from Milos. To the east you can see Polyaegos, or Polyvos, one of the largest uninhabited islands of the Aegean, with an area of 18 km2. It is currently used for pasture, as it probably was in ancient times, as suggested by its name (poly+ aiges=many goats).